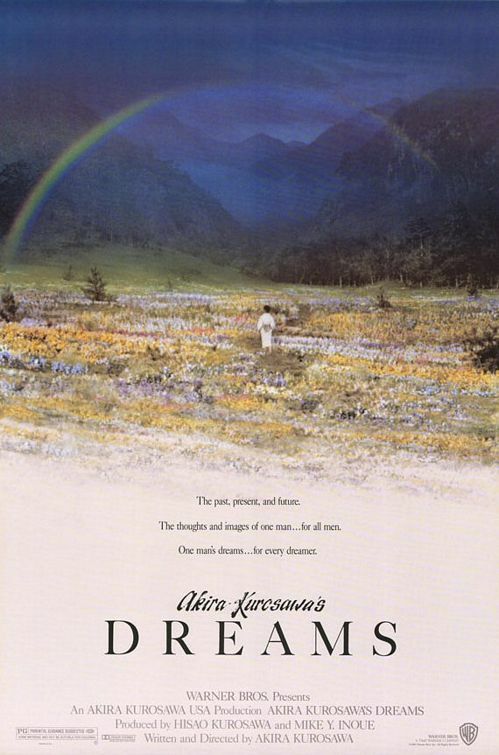 Akira Kurosawa's 1990 magic realism journey does not have a central plot but is a portmanteau with the script evolving from, as the title suggests, actual dreams the film-maker had. To get the most from it one needs to understand a little of Kurosawa as a person. Kurosawa came from Samurai lineage and his childhood was steeped in old-world Japanese tradition that respected nature and the change of seasons. In Something Like An Autobiography, he recounts how when a child, his father used to send him out in the morning with a fishing net, cooking pot and bare essentials, with instructions to not return before sundown; he had to fish in the stream if he wanted lunch. The opening segments of Dreams reflect on our relationship with nature. 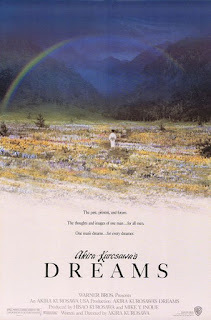 In Sunshine Through the Rain a little boy (from a family called Kurosawa), slips out against his mother's advice into the woods and espies a wedding procession of "foxes", only to be told he can return home after he has begged forgiveness for his transgression from the angry foxes. The Peach Orchard's child protagonist is berated by a gallery of living dolls, representing the spirits of peach trees, for the culling of the titular orchard by his family. The Blizzard takes inspiration from the same folk legend that inspired the Yuki Onna segment in Masaki Kobayashi's Kwaidan - a group trudging through snowy mountainous terrain is caught in a heavy storm, and one by one succumb to the elements and even the leader finds himself growing powerless and sleepy in the arms of the Snow Queen. Nature takes a different role, as the muse and inspiration for art in Crows, the episode devoted to Van Gogh. Played by Martin Scorsese, the painter is depicted as one obsessed with and compelled by nature to make his art. In The Tunnel, a lament on war, a military commander goes through a tunnel and is faced by the walking corpses of his erstwhile unit. He apologises for having led them into a conflict both futile and fatal. In a final tearful command, he orders them to march back into the tunnel whence they came. Both Mount Fuji in Red and The Weeping Demon express Kurosawa's strident anti-nuclear stance, something he had dealt with earlier in the drama I Live in Fear. One talks about the state of panic induced by a nuclear catastrophe and the other is a grim fairy tale set in the aftermath of radioactive fallout. Kurosawa who was a master of innovative film-making was apparently a technophobe in other aspects of life (''Modern technology and and I do not get along. My son tells me I look like a chimpanzee when I try to dial the telephone, and it would be hopeless for me to try to drive a car.''). Dreams' last segment - Village of the Watermills - speaks of a utopian return to an older way of living, of forgoing technological advancement and its accompanying effects in favor of settling to a slower rhythm, in greater harmony with nature. Anyone who has seen Kurosawa's films will recognize in Dreams, the auteur's philosphies. Kurosawa's approach to his story-telling was always simple and direct, rarely dabbling in artistic ambiguities or playing with the perception of the audience. In consequence, the messages conveyed through the various segments of Dreams (respect nature, simple living is good, nuclear proliferation is BAD!) can come across as heavy-handed. But the visual expression of his ideas is powerful - the rhythmic procession of the "foxes", the dance of the peach orchard "dolls", the march of the dead soldiers, the Van Gogh landscapes through which the protagonist walks before meeting the man himself, raging Mt Fuji, the watermills village - His sensibilities as a painter get full reign here and, in conjunction with Shinichiro Ikebe's moving score, make Dreams a memorable and highly rewatchable experience from his fimography.